The Rover Mobile Makerspace Table with 6 Metal Stools by Haskell was engineered to be easily transported across the hall or across the district as a solution for the shared maker curriculum. The Rover Table is constructed with all metal welded frame, durable locking casters and features a flip-top butcher block top that can fit through standard doorways. Keep your fab lab organized with two included bin storage units (10 bins total) that can be accessed from either side of the table. 6 stackable stools can be easily placed in the center of the table when the top is up for convenient transportation between classrooms. Whether your school has a dedicated makerspace or not, mobile makerspaces are an excellent solution for ensuring your maker activities are available when and where they are needed. 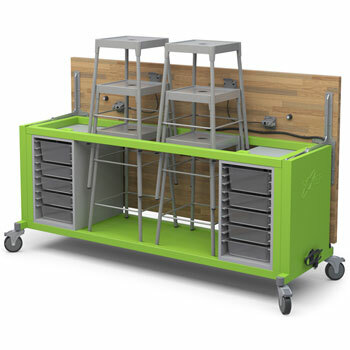 With an open frame design that accommodates 6 stacking stools (included), optional integrated power, and a top that easily lifts and retracts to fit through a standard 30” doorway, The Rover Table removes the limitations that mobile makerspaces have had in the past. Free Shipping on high quantity orders. See item detail pages for exact quantity and contact us to order.